The Back Bone of Corey’s Road to Healing. This super easy recipe is packed with so much goodness for nutritious skin healing and more. This immunity building broth is rich in glycine (needed to build connective tissue so crucial in healing skin infections), collagen, calcium, magnesium and also vitamins B6, A and C from the vegetables used. 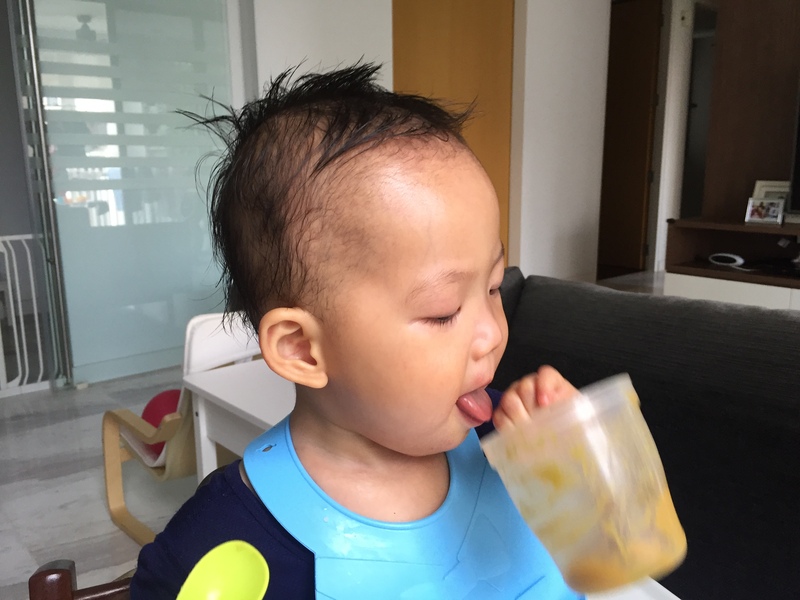 It was only after I stopped working when he was 1, and took the time to research and refine this nutritious skin healing broth recipe, that he started to showed a noticeable improvement of his eczema. 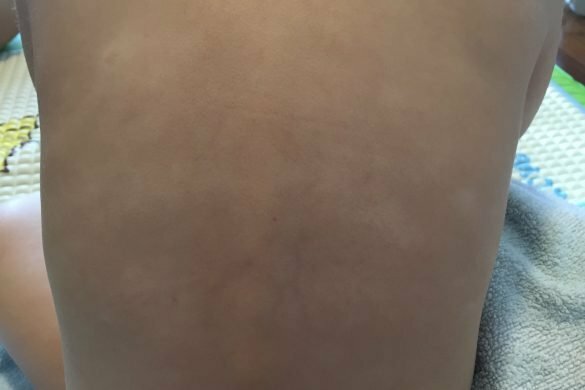 When I say a noticeable improvement, I mean consistently more and more healthy, soft baby skin. 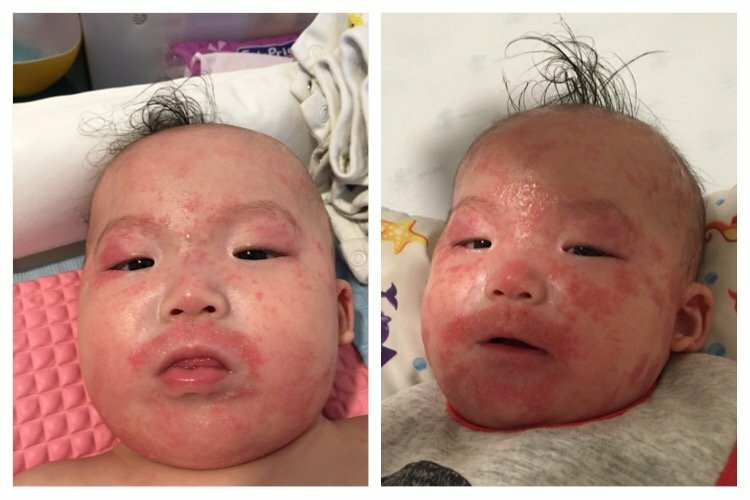 Before taking this stock, he might have some random days of good skin from the rigorous skin care regime, but it always felt a bit dry and parched (no matter how much fluids he drank). 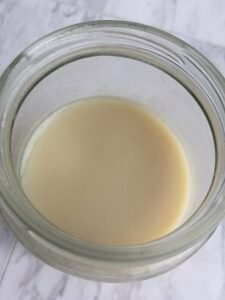 I was inspired after reading about healing the gut to build immunity for the skin (among other benefits). And with Corey’s healing, I witnessed first hand it’s impact through this broth. 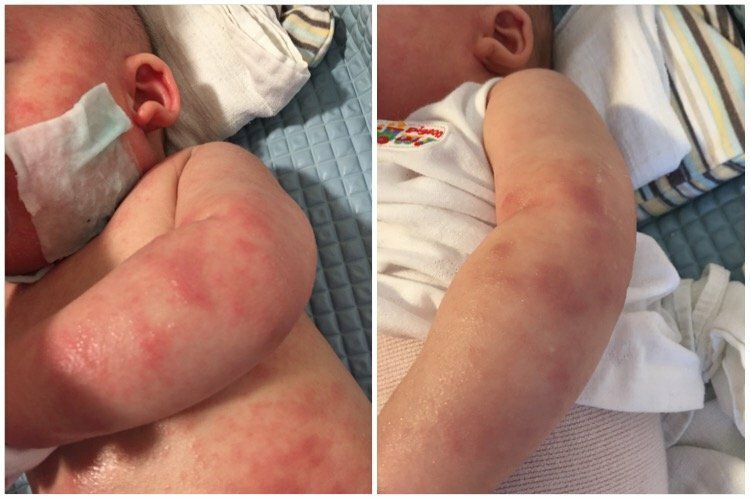 The photo on the left shows the flare up he suffered on his back after we came back from a holiday in Perth (8 June 2017). As I was unable to bring my homemade broth, I had to use store bought ones and his skin suffered while we were there. 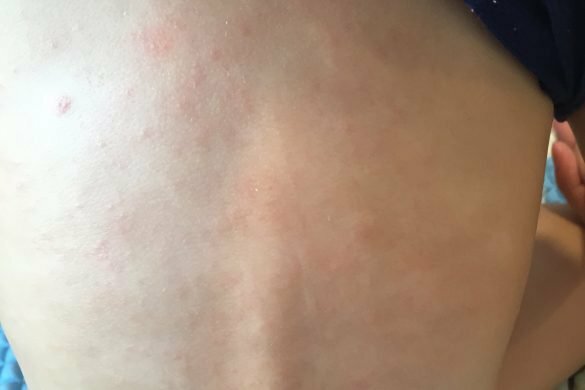 The photo on the right shows one week later (16th June 2017) with clear smooth skin. 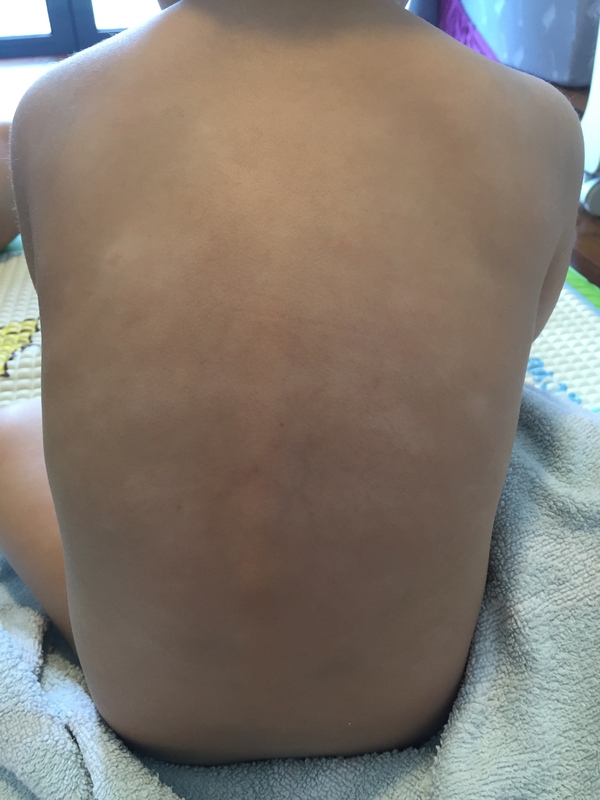 The white discoloration is due to scaring from the eczema inflammations. 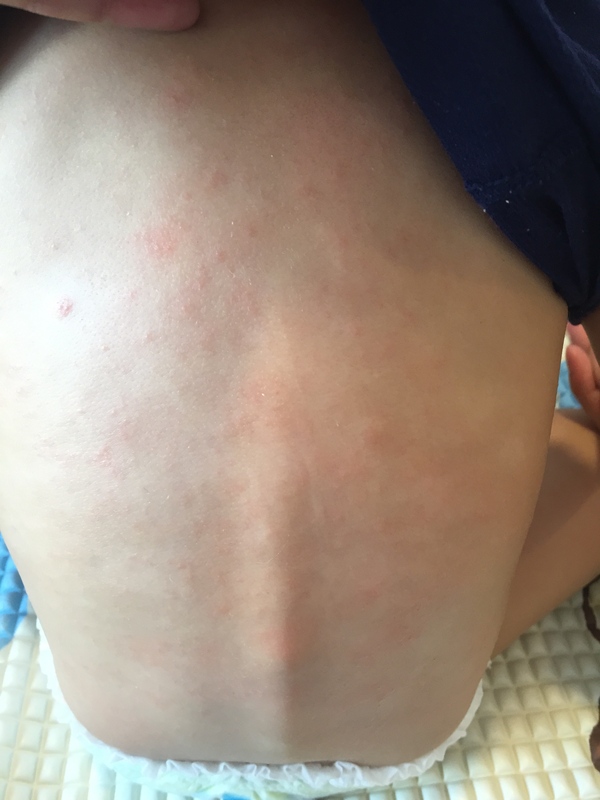 A quick check with Dr Hugo confirmed the scaring and that it was not fungal and will hopefully fade in time with moisturization and good skincare. HOW MUCH NEEDED TO SEE THE DIFFERENCE? 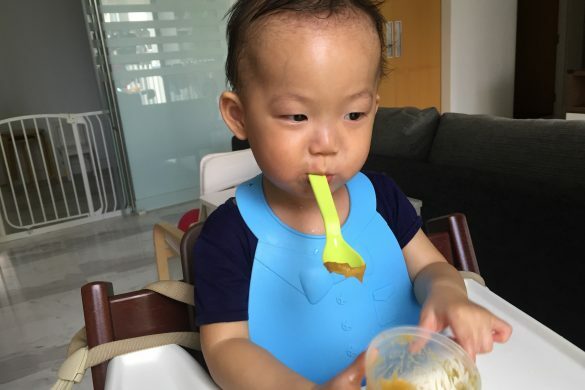 From the time he was 1 year old, Corey takes 2 helpings of this nutritious skin healing broth daily in the form of rice porridge, at lunch and dinner. I also supplement it with skin healing vegetable puree and fruit puree (recipes will be shared in later posts). When he first started taking this, it took around 2 weeks for noticeable improvement. This was probably due to the extensiveness of his eczema and every baby is different, so be patient with it. No salt nor preservatives are used in this recipe and it tastes great just on its own. This recipe is adapted from THE ECZEMA DIET which is my cornerstone reference in building Corey’s diet. 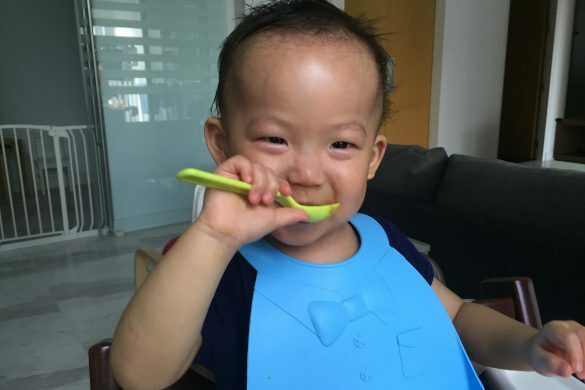 I have referred to infant food charts from Baby Center.com for age appropriate solids introduction, and also tips from my grandmother’s cantonese soup recipes. 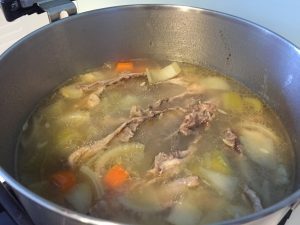 I married the best practises of making bone broths along with adding my grandmother’s favourite soup ingredient, old cucumber, which has lots of healing properties. In Chinese culture, old cucumber is cooling and balances out the heatiness ‘Yang’ in our bodies. It also contains vitamins B6 and C which are crucial for healthy skin. I love this recipe for its multiple uses. The natural sweetness of this stock makes it a favourite staple in my family. We seldom need to add salt or other flavourings to it. We make Chinese soups using this as a base and it helps to boost immunity. This is particularly useful in a household with 2 young babies, especially as my 3 year old toddler goes to childcare and bring home lots of germs. 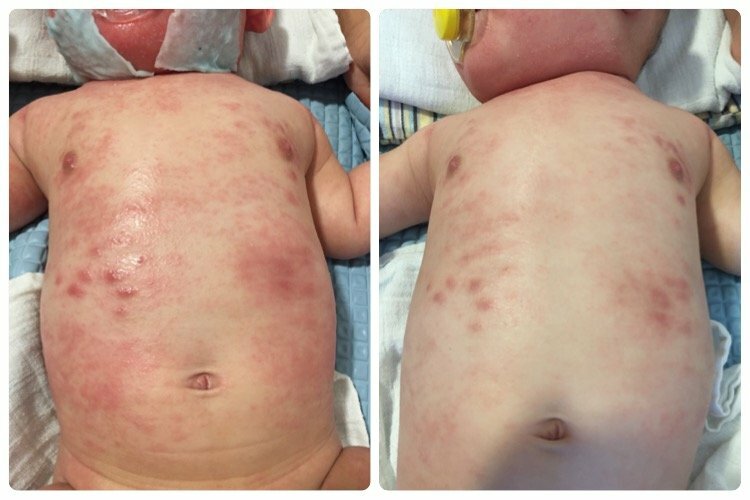 A broth is not medicine, so taking it alone will not create miracles and make your baby’s eczema disappear overnight. Other skin happy nutrients of a good mix of vegetables and fruits, along with a good skin care regime will be key to battling baby eczema. I will share tips on skin care and other yummy purees for babies in later posts so check back later. 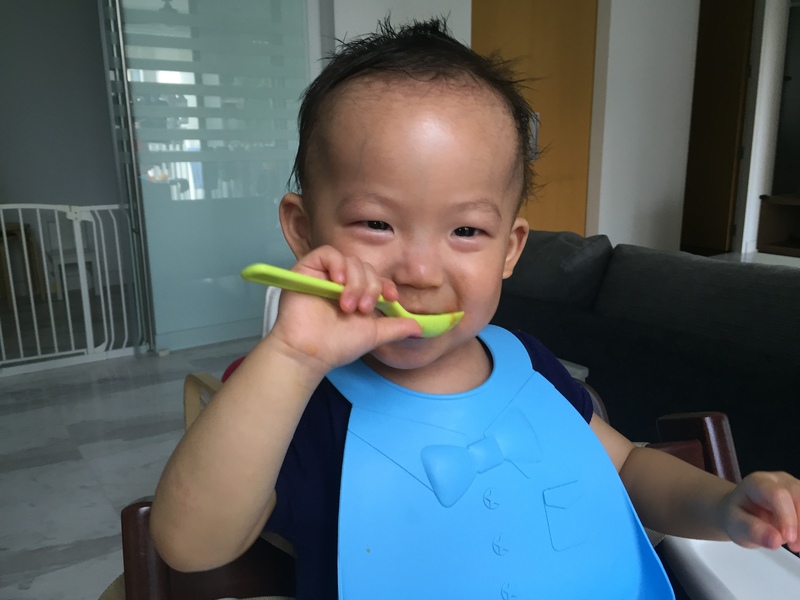 This recipe is suitable for babies 9 months and older who have started solids comfortably. 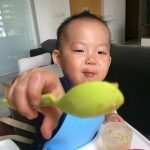 Follow this Baby Center.com’s method of introducing any new ingredients listed in this recipe, especially if they are just starting on solids. This is to make sure they are not allergic to any of the ingredients used. 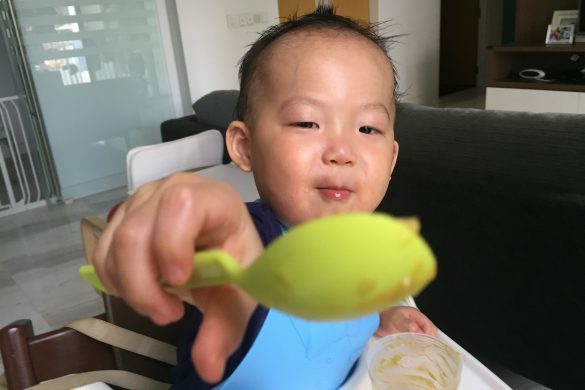 You can feed it to babies as a soup, or use it to make rice porridge, which is highly recommend as the rice absorbs all the flavour and goodness of the broth. Related: Corey’s Skin Healing Broth is now a Breastmilk Booster! 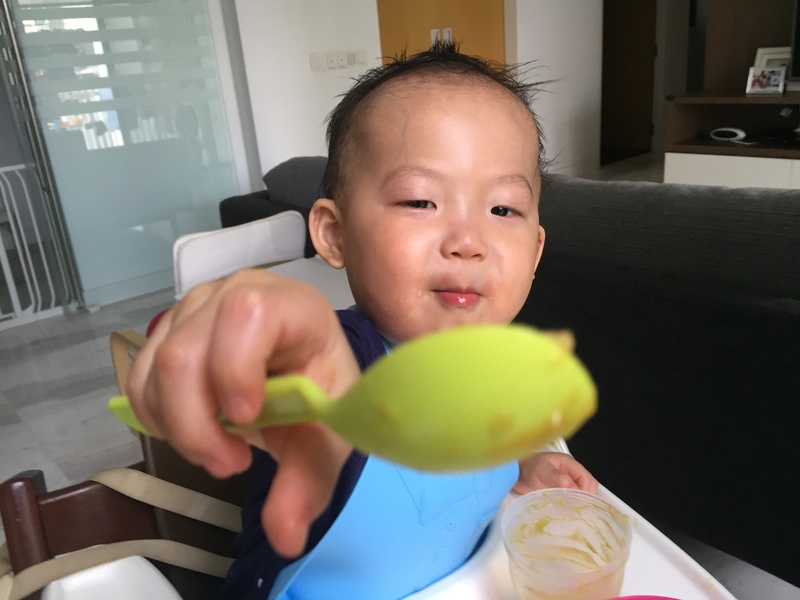 The following photos show him enjoying his lunch today! Place all chicken parts into the stock pot and add the water and apple cider vinegar. Let it sit for 1 hour. The apple cider vinegar will help to leech more minerals from the bones. After an hour, pour away the water and add the vegetables. Then start a low fire and brown the chicken and vegetables (No oil is added as chicken has natural oils) till a nice aroma fills the kitchen, or the chicken turns slightly brown. Then add 1 litre of cold water and a simmer over an uncovered pot. Let the stock simmer for the next 3 hours, occasionally checking on the water level (which should nicely cover all ingredients) and top up if necessary. When your chicken bones have broken down which is approximately by the third hour, turn off the fire. The cooking is essentially done. Carefully sieve out all the solids. I find that it helps to sieve a few times and use a cheesecloth together with a regular sieve. Take particular care with this step to avoid risking having any small bits which may be dangerous for young babies. Transfer to a glass jar and refrigerate overnight. A layer of fats would have risen to the top and harden by the next day. Skim off this layer and discard before using as it is unhealthy. This homemade broth will tend to have a cloudy appearance. Even after making this hundreds of times and sieving it more than once it still has some particles. Its normal and maybe its because homemade broth has so much more ingredients than the store bought ones! Anyway it did bother me for a while so I just had to check it up, and i'm happy to report that it is the taste that matters! And more importantly, it is the prized gelatin that you want to aim for as that's how you know your stock is jammed packed with nutritious skin healing glycine. I found that by placing the cooked stock immediately into the outer pot of the Tiger non electric thermal slow cooker for another 4 to 6 hours enhanced the flavour. 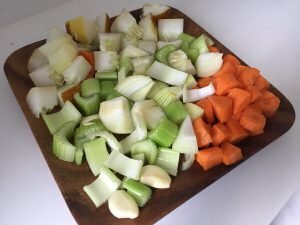 I use a Tiger Magic Thermal slow cooker to lengthen the cooking time, but this recipe also works with regular stock pots. 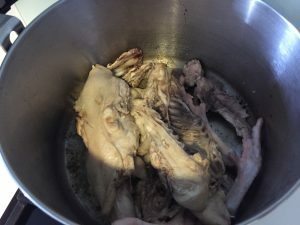 Once the bones have broken down, the stock is flavourful enough for use. I use old cucumber which is readily available in our Southeast Asia region. It is known for its cooling properties in Chinese culture. You can replace this with regular cucumber which also has similar properties and has a mild taste that makes for a great broth base. This stock is fresh for up to one week in the refrigerator. 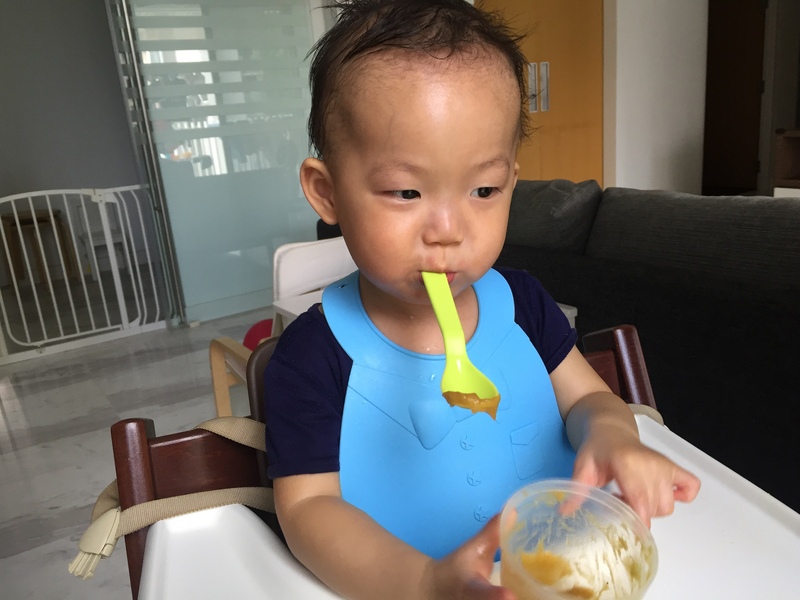 My son is now 18 months old and I use approximately 100ml for each meal (approximately 5 - 8 tbs). You can also make bigger batches and freeze into ice cube trays. So far we love this stock so much in our house that we never have enough to freeze and end up making it fresh weekly! Thank you very much. Will try it out! What do you mean by 1 litre of water for vinegar soak? And the broth can use to make porridge right? Hi Michelle, soaking the bones in vinegar first helps to break down the bone matter and releases more nutrients from the bones. Read more about this crucial step in the following link! Hi Michelle, yes you can use it to make porridge, noodle soup and also pastas. Its a great way to start weaning baby. All natural flavours with no salt or additives. You can add salt to taste if serving to adults and older children. 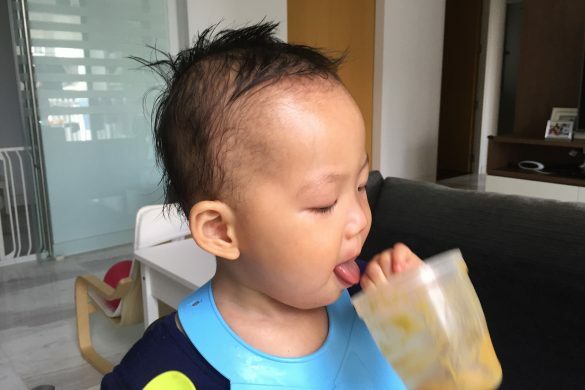 Thanks for sharinh, mummy Amanda. I am a working mum which is always struggling for time. Can I use the same ingredients but simplify the process? Eg. Put in all ingredients as well as apply cider..and use pressure cooker to cook for 1 hr? Thanks for sharing. Can I use the same ingredients but simplify the process? Put in all ingredients as well as apply cider..and use pressure cooker to cook for 1 hr? I am a working mum. Hi Hann!! Yes you can definitely simplify the process using the pressure cooker! In fact I’ve recently bought one and been trying it out.. will post my recipe and ingredients once I get the proportions right! What can i replace old cucumber? Its hard to find that right now. And instead of chicken can i just yse chicken feet?